It is important for all the web based business owners to have a good website. Only a reputed e-commerce website builder has the potential to deliver such a website for the people in need. A lot of e-commerce website builders can be found in the Internet and Shopio holds a prominent place out of them. They have the potential to deliver a robust ecommerce website for your business with all the useful features. Keep on reading this article to learn more about Shopio and what it can deliver to your business. Shopio offers five different pricing options for the business owners. They are named as “Small”, “Medium” and “Large”. Even though it is affordable prices, you can enjoy a wide range of benefits including unlimited file storage, unlimited bandwidth and access to over 100 core features. You will also get the opportunity to access additional features such as blogs, newsletter subscriptions, coupon generators and many more. This is one of the most prominent features that highlight Shopio over its competitors as they don’t offer such features free of charge. The other packages are also impressive and they come along with a lot of useful features. You can subscribe to any of those packages for free thanks for the trial feature option. In other words, you can try all the packages for free and decide the best package that meets with your specific business requirements. This will assist you to save a lot of time as well as money. Who can think of using Shopio? Shopio is ideal for both small and medium scale businesses. In fact, it has all the features that a small to medium scale business owner will need with regards to ecommerce. Another important feature that you can see in Shopio is its user friendliness. You can simply add products to different categories, add a payment gateway in order to accept credit cards, choose a customized e-commerce theme that is aligned with the branding guidelines of your business and use your own domain for the ecommerce website. You don’t need to be a web developer to use all these features. As mentioned earlier, Shopio is equipped with a lot of theme designs. They can be used to customize your ecommerce store according to the branding guidelines of your business. 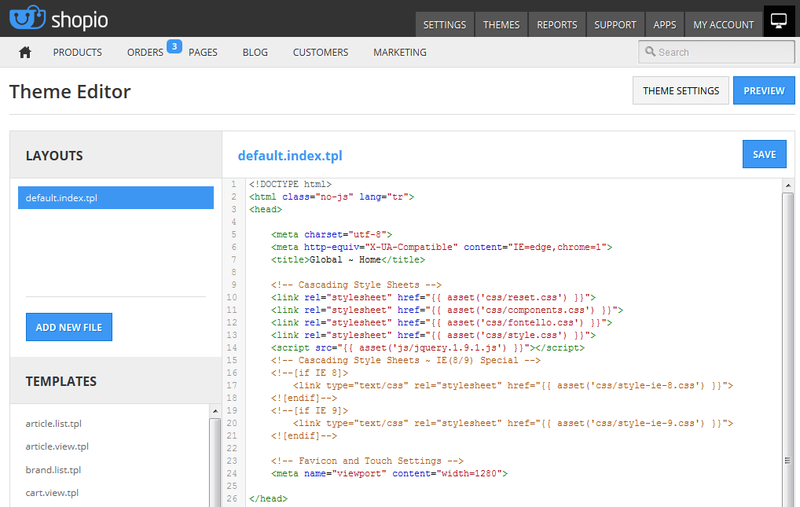 Shopio Theme Editor is very easy to use. You also have the ability to include an attention grabbing slideshow to your website. This can be used to promote the top selling products on your store and all the ongoing promotions. A lot of people in the present world are packed with busy schedules and they tend to shop using their mobile devices. Therefore, it is important for you to make your ecommerce website a mobile friendly one. Shopio has given that opportunity for you and you can simply optimize your online shopping store to mobile devices. This can enhance your sales volume in an effective way. Shopio delivers an excellent support for all their customers. Therefore, you don’t need to think twice before subscribing to a plan offered by Shopio. In fact that are equipped with a team that has over 10 years of experience in the industry. 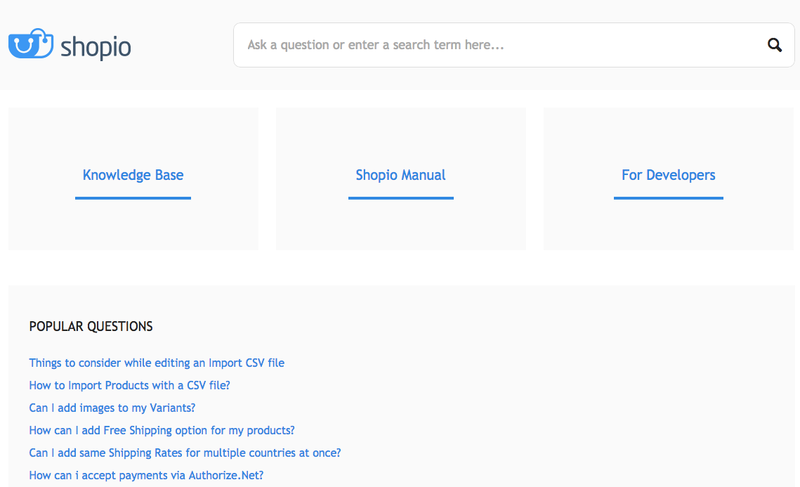 Shopio Support Center — Manuel, Knowledge base and more. Therefore, you will get the opportunity to find answers for your questions within a short period of time. The best thing about Shopio customer support is that it is available in all the 24 hours of the day and 7 days a week. They have also included a knowledge base system that will assist you to find answers for questions on your own. If you are planning to offer your services for people in every corner of the world, you need to be equipped with a solid hosting service. Shopio can offer that to you with the assistance of world class cloud servers. They guarantees maximum uptime and have the potential to handle massive traffic. Therefore, you will be able to sell unlimited number of products from your website without any hesitation. Moreover, they offer 128 bit SSL certificate for all the ecommerce websites. Therefore, you can offer a safe and a secure transaction experience for all your customers. Their personal information such as credit card numbers will be stored in an encrypted manner. This will allow your customers to purchase products from your shopping store with confidence and peace of mind. 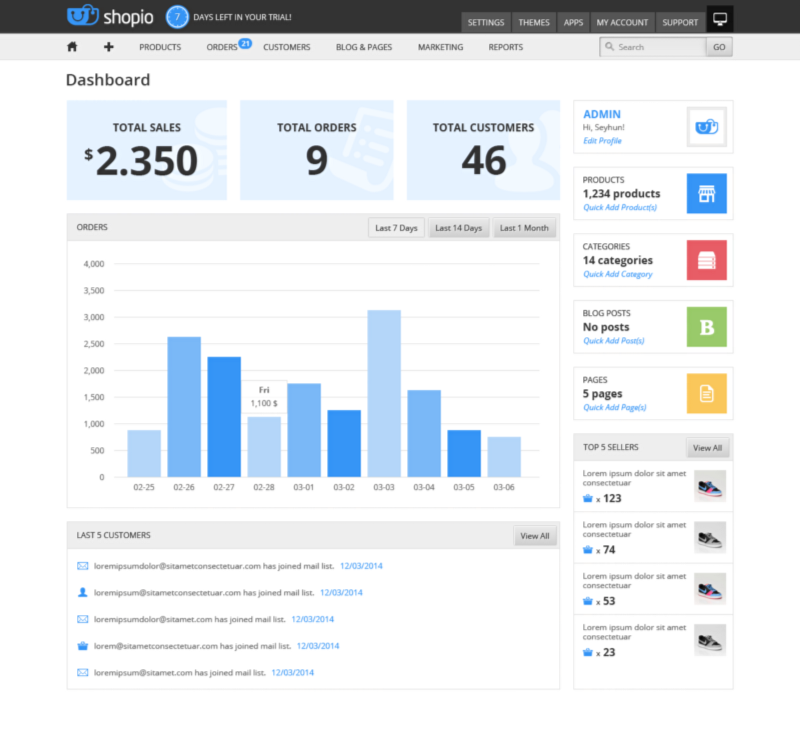 Shopio can be considered as one of the best ecommerce platforms available for the business owners out there. It offers few outstanding features that you cannot find in other ecommerce platform offering companies. Their collection of plans are impressive and there is something for everyone. In addition, you can subscribe to any of these plans for free and check whether it is the right option for you. Therefore, selecting Shopio to create your ecommerce website can be considered as a great investment done towards the future of your business.